There are plenty of beaming smiles at Castle House Dental Practice; it’s recently scooped a prestigious award for the Best Dental Team for the second year in a row. personal touch. From the relaxing waiting room, patients are welcome to enjoy its comfortable sofas, quiet radio and abundance of reading material. With free Wi-Fi and a complimentary tea or coffee (some patients arrive early for this reason! ), the experience puts you at ease. The practice provides first-class care to thousands patients throughout the Highlands. It even has patients who choose to travel from as far north as the islands and from the south of England. It has five dentists, three hygienists, seven nurses, and three reception staff; a combined dental experience and expertise exceeding five decades. Castle House Dental Practice thrives on educating patients in preventive measures to help avoid the development of serious dental issues that require complex treatment. ensure that patients are well looked after and comfortable. shows. We also have a strong competitive streak! “We run in-house competitions to paint the best egg at Easter and carve a creative pumpkin at Halloween. We ask our patients and anyone who may visit us to vote. We have team days, themed lunches and charity events. The good humour certainly livens the atmosphere and creates a fun environment while maintaining a high standard of professional care.” Patients are also encouraged to comment on any competitions on its Facebook page. Castle House Dental Practice provides a broad range of treatment from regular dental care for all the family to cosmetic dentistry and implants – an increasingly popular alternative to dentures. “We love making smiles look as natural as possible,” Anita explained. “One of the nicest things about restoring a perfect smile is that people become more confident. As a member of Highland Dental Plan, Castle House Dental patients can pay a monthly premium to spread the cost of treatment (offering maintenance and full care plans). In addition to restoring perfect smiles, the clinic offers facial rejuvenation in the form of Botox. The facilities are well set up to follow infection control procedures, making it an ideal provider. Consultations are free and treatment can often be booked in to coincide with any other dental checkup so only one trip is necessary. Botox involves injecting purified protein to relax and soften the activity of certain muscles, which in turn helps prevent fine lines from becoming more pronounced. “We pay particular attention to how we use Botox,” Anita added. “It’s important to use it sparingly to enhance someone’s natural beauty – using too much looks artificial. Castle House Dental Practice also offers an emergency service for registered patients and will always try to accommodate those who are not registered. It has a user-friendly website that should answer any questions you may have, and is always available by email. With designated parking, the practice is easily accessible for wheelchair users and for parents with young children. If you’ve recently moved to the area, or are looking for a new dentist, call Castle House Dental Practice on: 01463 234598. Smiling is good for you. It’s good for people around you, and it takes fewer facial muscles to smile than frown. Next to yawning, smiling is said to be the most contagious facial expression. Castle House Dental Practice in Inverness has a lot to smile about. 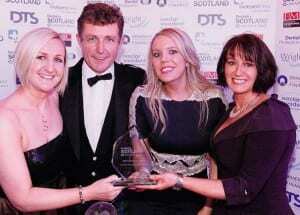 It has recently scooped a prestigious award for Best Dental Team from the Scottish Dentistry Awards. It’s the second year in a row the practice has been recognised for its friendly, supportive and innovative approach to dental care. The practice, based at Fairways Business Park, offers you a range of solutions to boost your smile with cosmetic dentistry, and to maintain a youthful appearance through a range of facial rejuvenation treatments. They thrive on educating patients in preventive measures to help avoid the development of serious dental issues that require complex treatment. Finding ways to support your oral health is easy when you register with Castle House Dental Practice. Its team is fully trained to share expert knowledge in an easy to understand way. They have more than 75 years experience between them! As a Childsmile practice they offer care for all the family. Smiling comes naturally when our teeth feel and look good. Yet if you have stained, crowded or missing teeth you might be self-conscious and considering the transformative effects of cosmetic dentistry. A confident smile and positive facial expression can transform your personal and professional life. Teeth whitening, straightening and implants are just a few of the treatments available at Castle House Dental Practice. “We are a vibrant and caring practice that puts patients care at the forefront of all that we do,” said practice manager Anita Leeming. “We will always ensure that patients are well looked after and comfortable. We enjoy what we do and it shows. We love making smiles look as natural as possible. You can never underestimate the power of a smile. People shine inside and out,” she adds. Why not look at their new website if you if you have any questions? Call or pop into Castle House Dental Practice for an extensive review of the treatments that will suit you best. With five dentists, three hygienists, seven dental nurses and three reception staff they are ready to support you in your journey to a healthy and natural smile. It currently provides first class care to thousands of patients in the highlands and much further. When will you start yours? Castle House Dental Practice in Inverness was recently honoured to be the winner of the Best Dental Team at the 2012 Dentistry Scotland Awards – but the best recognition of all comes from the patients. The modern practice, based at Fairways Business Park, has earned a reputation for outstanding customer care, which is why patients travel from as far north as Orkney and the Hebrides or as far south as London! The team of dedicated professionals work together seamlessly to ensure every patient feels relaxed, and comfortable, while receiving an excellent service. The team consists of five dentists, three hygienists, seven dental nurses and three reception staff, led by principal dentist Kevin Leeming and his wife and practice manager Anita. They have been working in the practice since 1996. It was previously situated in Castle Street but increasing patient numbers prompted the move to a larger, purpose-built facility in 2006. This is on a main bus route, has disabled access and dedicated parking. On arrival patients are greeted by a friendly smile and a warm welcome from the reception team. The waiting room offers relaxation and comfort with its soft sofas, the radio gently playing in the background and a plethora of magazines to suit all ages and interests. You will guided by one of the fully qualified dental nurses who are on hand to assist the dentist in every aspect of nursing care, whilst ensuring the patient’s wellbeing. Castle House Dental Practice offers a broad range of treatments from regular dental care for all the family to cosmetic dentistry and implants, which are an increasingly popular alternative to dentures. And it is not just a beautiful smile that Castle House Dental Practice provides it also offers facial rejuvenation (Botox®). “I know that some people are still surprised that we offer facial rejuvenation, but the reality is that we are fully set up to follow infection control procedures so the cleanliness of our practice lends itself to these fi elds particularly well,” Kevin explained. Castle House Dental Practice is a member of Highland Dental Plan, which offers patients the opportunity to budget for their dental care and treatment with affordable payment options.